Our services include lippage removal (leveling uneven tiles), stain removal, tile replacement, filling holes, maintenance, deep cleaning, sealing, color sealing, enhancing, and much more. 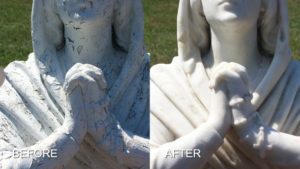 We restore natural stone and tile to its best possible condition for residential and commercial clients. Do your floors have dull areas associated with wear patterns, scratches, etches or spots? 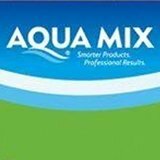 Using our powerful floor machines mounted with diamond-infused pads or brushes, as well as polishing powders, professional cleaning solutions, and other state-of-the-art equipment, our highly trained technicians refinish your natural stone, whether matte, semi-gloss or gloss finish, and make tile and grout like new again. 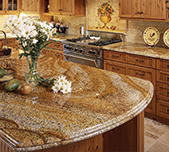 Dramatically improve the appearance of your kitchen floors, countertops and backsplashes, island tops and bar tops, and more with our expert services. 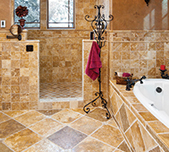 When it comes to bathtub surrounds, walls, and showers, and other bathroom surfaces, our expert technicians know how to deep clean and sanitize so your natural stone and tile surfaces sparkle once again. We also clean, seal, and restore outdoor kitchens, pool and patio areas, and other outdoor living spaces, including hot tub surrounds, exterior walls, stairs, waterline tile, and much more. 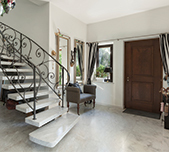 Learn more about the expert services we provide for your floor or surface type, including marble, limestone, travertine, granite, and slate. 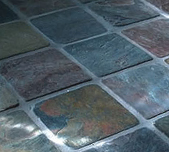 From soapstone and onyx to flagstone, Cantera, quartzite, we understand the unique properties of each type of natural stone, as well as quartz and engineered stone, and we have the knowledge, experience, and appropriate equipment and supplies to achieve fantastic results. 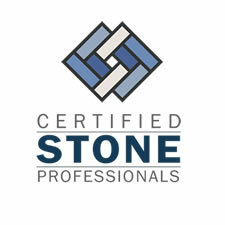 For a FREE estimate on natural stone and tile professional cleaning and restoration services throughout Western New York, including Rochester and Buffalo, contact us online or call (716) 759-4200 today.